This badge was issued to ADRIAN SOERANTO on 15 Jan 2019. This badge earner has applied knowledge gained from lectures to complete Watson Knowledge Studio hands-on exercises which include creating a project, defining a type system, pre-annotation tasks using dictionary and rule-based annotators, annotating documents and adjudication. 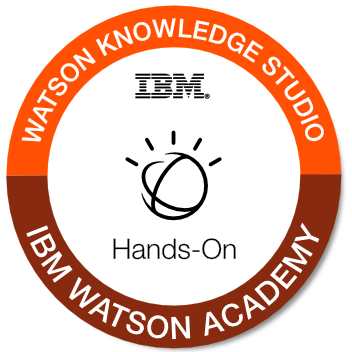 They have hands-on experience working with Watson Knowledge Studio. This badge is only available for IBM employees. Pass the quiz in the course with a 100% passing score.